I'd like some feedback on the hydraulic clutch set-up that I have installed in my 5.0 swapped Volvo 240. The problem I'm seeing is that that I'm not getting much movement at the clutch fork. The clutch fork travels between 0.5 and 0.75 inches at the most... and from what I've gathered reading online it should be more around 1 1/4 inches. Looking into what is causing this lack for clutch fork movement, my first thought was that it's not properly bled. 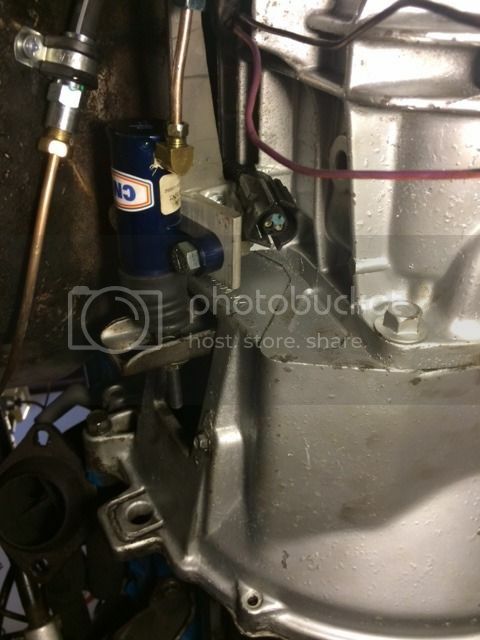 But I even used a motive pressure bleeder until no more bubbles were coming out, and the clutch fork begins moving as soon as I move the pedal. 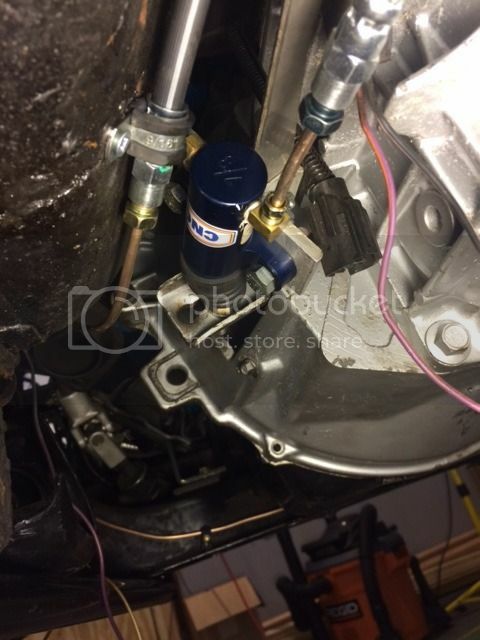 Then I checked the total movement I am getting at the clutch master cylinder input rod. I measured this to be 3/4 inch. Is this clutch input rod travel normal? Seems too little to me. Also, this brings me to my other issue with the way the system is sized right now; the clutch pedal is waaayyy too light. I think I must have buggered the clutch pedal ratio and ratio between master and slave bores. Now that I realize that the pedal travel is restricted to 3/4 inch, I did some calculations on what size master cylinder I should purchase to yield the 1 1/4 inch travel at the clutch fork. CNC Slave Bore = 0.875"
Here is a bump for you. I think the pin no the slave is sticking through the fork and thats only giving you that lack of distance. You want the whole rod to be on the back of the form pushing not pushing through it. The back side of the 260 master push rod is adjustable, thread it as far back as possible and it will displace more fluid. Also moving the push rod inward as possible will gain you more travel. I currently have more than enough travel at just about an inch travel. Last edited by 2fast242gt; 09-12-2016 at 04:13 PM..
Actually it is just a threaded rod from McMaster Carr, with nuts/washer snugged up against the clutch fork. That is why it is passing through the fork. 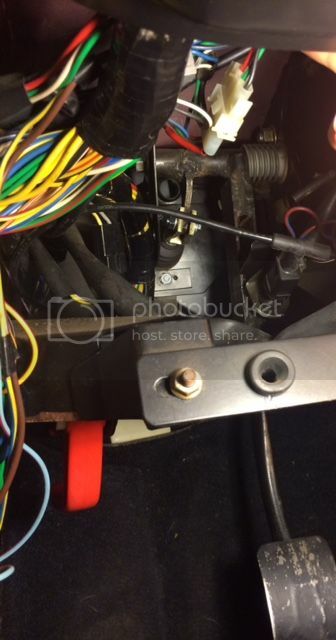 Yeah, I could adjust the pedal input rod, but I don't want too much preload in on the clutch. Good idea through, I'll look into this. How much travel do you have at the clutch input rod? I'm wondering if I have less than what's normal (because it looks like we have the same clutch slave cylinders. If you're worried about your ratios being off, you shouldn't be looking at area. You need to be looking at the volume of fluid that your master and slave displace. Volume is proportion to Area. Volume Displaced = Area * Stroke. I want an increase in volume displaced from the master, and and it would be difficult to change the pedal ratio (movement at the pedal vs movement at the input rod). 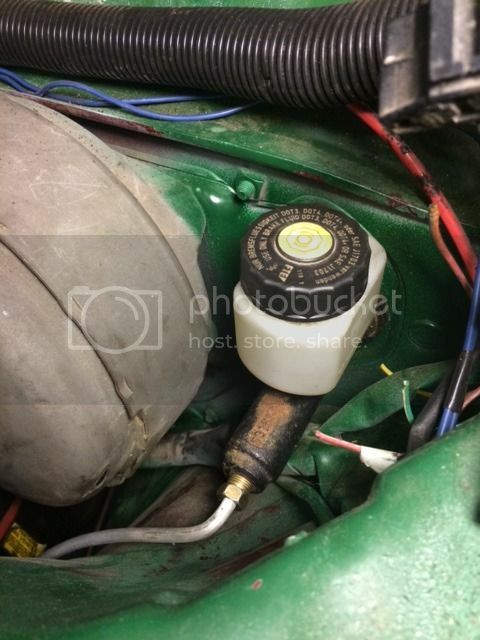 This leaves me with Area, which is leading me towards purchasing a larger master cylinder. Or transversely I could decrease the area of the slave cylinder, which would mean it would stroke further. Problem here is that the slave I bought does not come in any other sizes, only 7/8". Wilwood is very flexible when it comes to different size masters. Does the rod on the slave hit the bellhousing? from the pics it looks like it could get hung up. Good point. It currently does not hit the bellhousing, but I could definitely see it hitting once I start getting more travel out of it. I will probably trim the excess off the rod with a dremel cut-off wheel. Thanks! The little pusher arm you welded on your pedal to push the rod that pushes the master cylinder is too short. Because of this it doesn't push enough. Needs to be longer, she said..
From the looks of your picture, looks like your push rod is half the size of mine or half the length of normal.. Girth don't matter as long as it don't break. 740 turbo master and slave also. A longer rod will go deeper into the hole... Notice the length of it, dat bend..
Last edited by sbabbs; 09-12-2016 at 03:02 PM..
travel as in pedal swing? i have a O.E 260 pedal and master. I actually have the same setup as you. I have no preload on my clutch at all. in the video I actually have a return spring so the throwout bearing doesnt chatter at idle. At the slave cylinder push rod im not sure how much travel I have there any more but I do have the adjustment maxed out on the rod. edit, your pedal push tab does seem shorter than factory which obviously will push less fluid. sounds like you never seen a 260 master, because thats what he has from the looks of it. looks the same as my 260 master. Yeah but classicswede is in right hand drive land and they might use different master, like the queen. Yeah, I think we have identified the problem. I didn't realize that the pedal-push-tab needed to be that long. I kinda just lined it up with the center of the master, but in your picture it clearly extends further to give more master cylinder stroke. Now I just need to consider whether to redo the pedal tab or get a new master. Thanks for the input everyone!!! For reference when I did this someone measured the length of the tab on a 940 (I was using 940 master and slave) as just under 2" (50mm?). I ended up with a 59mm arm without issue. I went this route to avoid that. I'd rather deal with a leak outside the transmission. Totally agree. Not so bad having the slave in the box when you can get the box off quickly but this FWD tosh that takes ages to take off is a real pain. Oh I don't know, there have been some great projects! The only reason not to go concentric slave cylinder these days is if you *MUST* use a pull type clutch.